To celebrate the Chinese New Year for one of our most important markets, we have started a new blog series to honor our loyal supporters in China. Click here to read the full post in English. XYZ is proud to announce that we have partnered with West.cn for a second time to host an exclusive .xyz premium name auction between March 16 – March 31. Over 150 .xyz domains will be auctioned off at no reserve. Many of these domains have never been registered before, since they were originally variably priced premium names, which renewed for a premium fee. However, we have removed these domains from our variably priced premium list so that the winners of these domains will only be responsible for standard renewal fees! Among the domains being offered, the auction will feature six 2-number, seven 2-letter, ten 3-number, twelve 3-letter, twelve 4-number, eight 4-letter, and five repeating-characters (i.e. xxxxx.xyz & bbb.xyz) – all at no reserve. That means that these domains will sell to the highest bidder, no matter that final price is! The final domain auction will be for the highly-coveted 1.xyz. With a very reasonable price set, we expect this domain to sell for significantly more than the reserve. 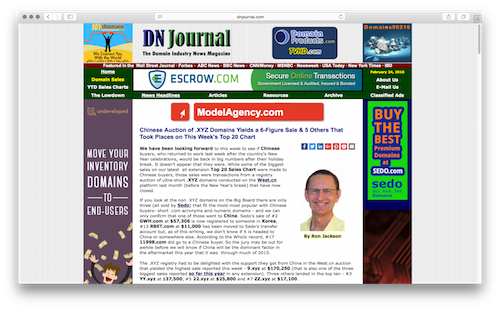 Guidelines, rules, and a complete list of domains offered for auction each day can be found here. The exclusive March auction with West.cn follows our extremely successful auction with them in December 2015. 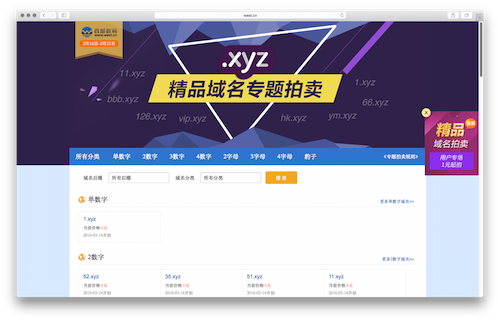 At that time, 9.xyz sold for 1,135,000 RMB, making it one of the highest reported sales in history of a new domain name. You can see a complete list of domains sold in that auction below. Because these domains were sold in auction, the buyers only pay our standard renewal rate for these domains! XYZ continues to focus on China as one of its most important markets, and we expect adoption to skyrocket after we receive accreditation later this year. As the popularity of .xyz continues to grow, we expect the great domains we’ve included in the West.cn auction to receive a lot of attention from domain investors all over the world. We are also considering direct sales of variably priced domains. Packages begin at $500,000 USD. Serious offers may be submitted to hello@gen.xyz. To celebrate the Chinese New Year for one of our most important markets, we have started a new blog series to honor our loyal supporters in China. Scroll down to read the full post in English. Recently we’ve seen many messages on Weibo asking the question, “What is your dream?” This week we want to talk to everyone about our dream here at XYZ and also show you some of the dreams of our .xyz users. Our dream is to cultivate the global Generation XYZ community where users have the choice, flexibility, and affordability to connect online and reset the Internet. Last week, we showcased several use cases from tech companies that we thought were really cool. This week we want to highlight individuals and small companies around the world that are also using .xyz in creative and beautiful ways. These individual users are expressing their dreams and passions with a .xyz domain. One of our favorite websites is IamTK.xyz. TK is a travel blogger who was born in Bangkok, Thailand but now works as a circuit designer in San Diego, CA. What’s TK’s dream? Well, it seems like he loves traveling around the world with his camera and writing about all the places he’s been. It almost feels like you are traveling with him through his photos. Oh, and he also loves to squeeze in some gadget talk here and there in his blogs. 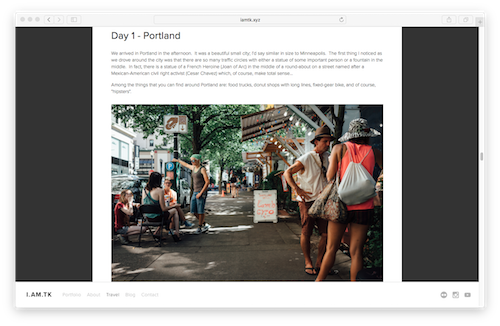 Check out how he’s showing off his dream of traveling through his pictures and blog! Another awesome site is Whenthelightsgodown.xyz. 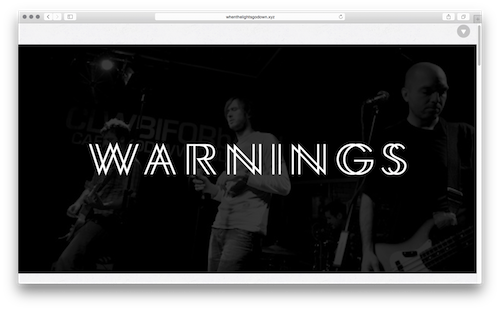 It was set up by a true fan whose dream was to honor the UK-based band, WARNINGS. After WARNINGS disbanded, this fan created a website to showcase the songs he loved and the feelings that came along with listening to music. If you are a music lover, you should check out this website! 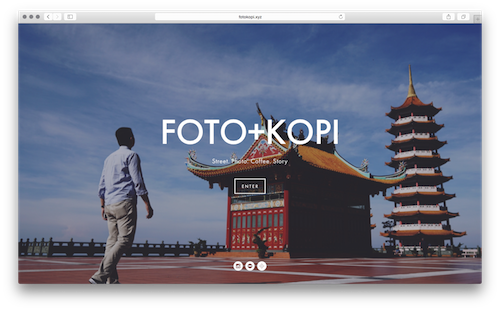 Fotokopi.xyz, was started by an independent photographer in Southeast Asia. It’s obvious to see when you visit this site that his passion is photography and his dream is to capture every moment of his life with creativity and craftsmanship. You can see that he strives to not only hone his skills but also to improve his photography each and every day. He wants to use his photos to tell a story with the hope that he can help the people around him to tell their stories through pictures too. Explore his beautiful photography and let it inspire you! Team XYZ believes that dreams can come true if you put enough effort and passion into them, which is why we are so passionate about working with our friends in China to help them build their dreams. We love showing off the websites of small businesses and individuals pursuing their dreams through a .xyz website. As we move forward with accreditation, we can’t wait to promote some of the cool Chinese sites we will see! We hope these sites will inspire you to pursue your dream, and together, we can help you to fulfill it. Not sure where to start? Visit one of our registrar partners below to get your .xyz domain on sale now. Then add us on Weibo and tell us what your plans are for your new site! It’s a fact, innovative high tech companies love .xyz! From design apps to robots to even audio narrators, we’ve have support from some of the most innovative companies. Are you an iPad user and love to sketch? 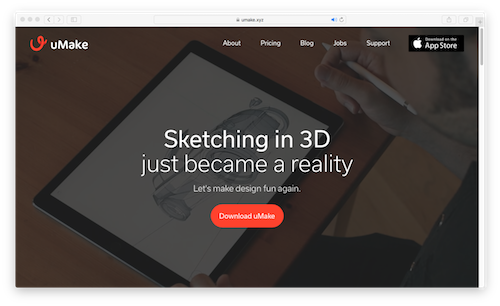 Check out UMake.xyz the most popular 3D sketching app on the iPad Pro. 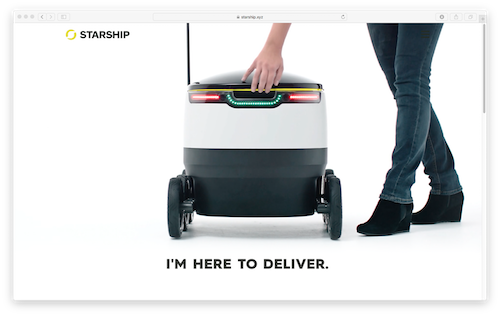 Or, if you are looking for a cool way to deliver some products without going to your local UPS or Fedex, check out Starship.xyz, which was recently launched by the cofounders of Skype to provide local delivery services with the use of robot cars! 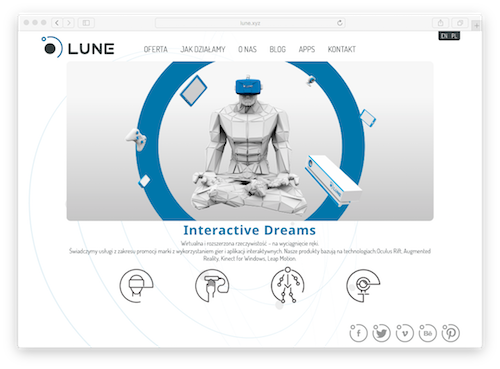 And there’s Lune.xyz, which is a super cool virtual reality company that uses an interactive application to take you to a new dimension. This means brands can provide their customers with interactive applications where they can experience, see, hear, touch, and smell products before they buy! There’s also Elon.xyz, a platform where users can submit articles, turn them into narrated audio recordings, and listen to them at their leisure. How cool is that? 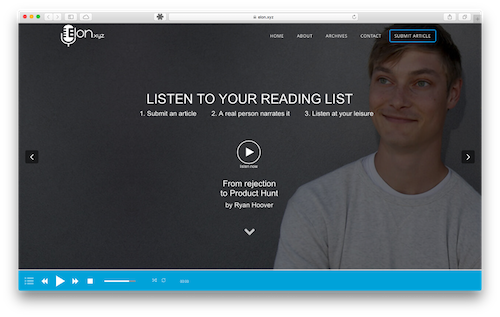 This tool can definitely help you stay up-to-date on your reading list or simply rest your eyes by listening instead. We also think that this is a great tool for our Chinese friends trying to practice their English. Why are all these technology companies in love with .xyz? Because we are simple, memorable, and affordable. With .xyz, the opportunities are infinite and our goal is to create a global community inspired by the internet and its limitless potential. As we work towards our accreditation, we look forward to seeing many cool sites that our Chinese friends can create using their .xyz domains later this year. If you are interested in checking out many other cool sites, please visit our website www.gen.xyz/live and www.gen.xyz/blog. What does .xyz stands for? To some Chinese they say .xyz could mean “Little Universe” (小宇宙). It could also mean “New Asia” (新亚洲) or “Believer” (信仰者). It could also mean the “The Next Chapter” (下一章). To us, .xyz is for every website, everywhere. It is something you, as a business or individual, can bring your own meaning to. .xyz is both generic and memorable. It has three letters, just like the other popular domain extensions, but does not contain pesky vowels. It’s simply three memorable consonants at the end of the alphabet, making it perfect for every website, everywhere – especially in China. Because .xyz is an international domain extension, .xyz websites can rank highly in search results all over the world. For example, the popular Japanese web magazine Jagzzi.xyz is a website almost entirely in Japanese, but is still the top search result using Google.nl! We’ve always said “you end the alphabet with XYZ – you end a domain the same way.” But .xyz is also the beginning of YOUR own Little Universe (小宇宙) within the New Asia (新亚洲) of the Internet and especially is your NEXT CHAPTER of domain names. .xyz is what YOU make it. You can carve out your own space, and no one can take that away from you. In that, we are the true Believers (信仰者). 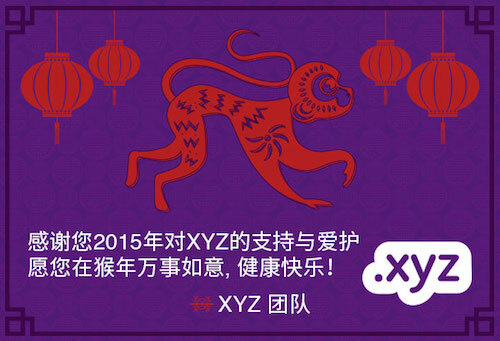 The XYZ team wishes everyone a joyful Lunar New Year! We are celebrating this wonderful holiday the same way as our Chinese friends: visiting loved ones, eating great food, and wishing everyone good luck in the year ahead. No fireworks here in sunny California, but hopefully there will be plenty of red envelopes (Thanks Mom)! As we reset the clocks for the New Year, we would like to thank everyone who helped us reset the Internet. In less than two years, there are now over 2 million .xyz domains registered all over the world, including over 700,000 in China! Please visit www.gen.xyz/premiums for ideas of what .xyz domains to register (NNNNNN.xyz combinations are being registered quickly, and we expect all of them to be acquired by the end of the year). For additional news about .xyz, please read our open letter to our supporters in China here. Please also subscribe to our newsletter to receive the news about .xyz and our progress in China. The XYZ team wishes everyone safe travels as you reunite with your beloved families and friends for the upcoming Chinese New Year holiday. We have some very good news to share with our supporters in China: we have acquired our Chinese business license! In 2016, we expect XYZ to be one of the first non-Chinese registries to be fully MIIT accredited. Not only will you be able to host your .xyz websites in China, but we expect the popularity of .xyz should grow significantly in the new year.